When God wishes to increase our suffering he sends us theologians. At least, this is one lesson Job learned; his infamous comforters were well informed and had undergone deep, mystical experiences; but their learning had no useful lessons for Job. These armchair philosophers lacked the wisdom that life requires; they thought that Job’s suffering was a philosophical conundrum and that his questions were academic. So they gave the simplest answer available to them. God punishes the guilty by making them suffer; therefore, Job’s suffering was evidence of his guilt: Job needed to repent. This is very neat, very tidy and very rational. After all, Job’s comforters could not monitor all his activity. Surely Job had some secret sin which they did not know of and which he had not confessed? But the reader – who has a “God’s eye view” of Job’s plight – knows better. The reader has already learned that Job had sacrificed for sin and that God had declared him righteous. God had reasons for allowing Job’s suffering – reasons that we will come to. But these were above the reach of the philosophers. In any case, when Job howled like a wounded animal before the philosophers, he was not asking for philosophical answers. He suspected that his life was meaningless and so he wished to be erased. He could no longer sense any goodness or joy in creation, so he desperately desired not to exist. What Job needed was reassurance and vindication. He needed to know that God was great enough to defeat evil and he needed God to defend his honour before an accusing world. Job did not deserve to be left alone, without love, comfort and hope. He had lived for God; did he live in a universe in which faithfulness and goodness counted for nothing? Ancient doubts are often regurgitated in contemporary culture (and fashionable theology for that matter!) . Nihilism is alive and well and oh-so scientific. After all, aren’t we merely the products of atoms and molecules and the shuffle of our genes? Isn’t every human, at heart, a selfish-capitalist seeking to maximise gain and minimise loss? If so, there is no transcendent goodness that can redeem suffering. In the trials of life some people are going to get hurt. Some people will be casually eliminated. Deal with it. At least we have the comfort of knowing that the stars can’t last forever, and that life, that titanic waste of time, will be extinguished with their light. If the universe is to have substantial meaning there must be something greater than the universe. So God intervenes in Job’s story– he must if anyone is to have hope. Job learns, by direct experience, that God is great enough to defeat evil. Then God declares to his accusers that Job’s suffering was not a punishment. In fact, there were deeper reasons for this tragedy. Job is not told these reasons because he does not need to hear them; vindication and comfort are what he requires. Job’s counsellors are not let in on the reasons because they are not wise enough to understand them; they need to learn humility before they can teach others about God. Here, God pre-empts the accuser: “Have you considered my servant Job?” The cynical Satan is not content. Sure, Job is faithful, but God has bribed Job with a prosperous life, full of love and comfort. Job is only in the religion game for the short-term benefits. Take those away, and you’ll find the rebel inside. The devil is sure that human hearts cannot be transformed and God has not created any goodness in Job. So God gives his enemy permission to test Job; he will discover for himself that Job is faithful. The book of Job is not the story of a bet between God and the Devil. The stakes are too high for any wager. Job loses his family in a day. When that does not break him, Satan tortures him. Yet Job remains faithful. This establishes that the accuser was wrong: God is good and the human race is not beyond redemption. Having learned his place, the evil one disappears very early in the book of Job. That still leaves Job with his unanswered questions. From the perspective of the divine court we can see that Job’s agony is meaningful. His trials have a purpose: in the drama of Job they establish that God is good, that he knows his people and cares for them. Job illustrates that the most terrible suffering can be conquered by God; that even the collapse of our entire world is not enough evidence to establish that God has abandoned us. But Job does not see his life from the heavenly court. He does not even have the luxury of studying the problem of evil in a well stocked library. On his own, with no human counsel or love, in the depths of despond, he must choose. Will he curse God and die? 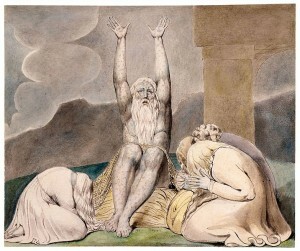 Job refuses – even if God slays him he will not abandon hope. Is this a blind faith in the face of overwhelming evidence? Hardly. Depressed and exhausted, Job is in no position to engage in abstract arguments. When breathing takes effort and eating a chore you need something more than a philosophical proof. Job chooses to believe because the alternative is worse than his agony. He would be forced to admit that his grief was not rational, because his sons and daughters were an insignificant consequence of a chaotic universe. He would have to concede that love was not stronger than death. He would lose all hope of justice and redemption. Job believes because he has no other choice. He is profoundly rational and his story could not be more relevant to our time. This entry was posted in Christian Theology, Existence of God and tagged "Leap of Faith" (Not), Evil, Existential Reasons for Faith, Job, Problem of Evil, The Problem of Evil. Bookmark the permalink.